Designing for Public Space engages a research team of Emily Carr design faculty and senior-level students to develop human-scale interventions and solutions for the public realm. Utilizing principles adapted from architecture, urban design, industrial design and exhibition design practices, the project incorporates topics including context, way-finding, materiality and scale; as well as the collaborative and practical aspects of working in public space. Considerations of sustainability, public vs. private space, temporality and civic responsibility will inform research and the development of prototypes. The intent of this project is to provide partner municipalities with creative, practical and innovative solutions to real-world matters situated in the public realm. In collaboration with Charlotte Falk, Jean Chisholm, Marcus Denomme, Celine Hong, and Augusta Lutynski. 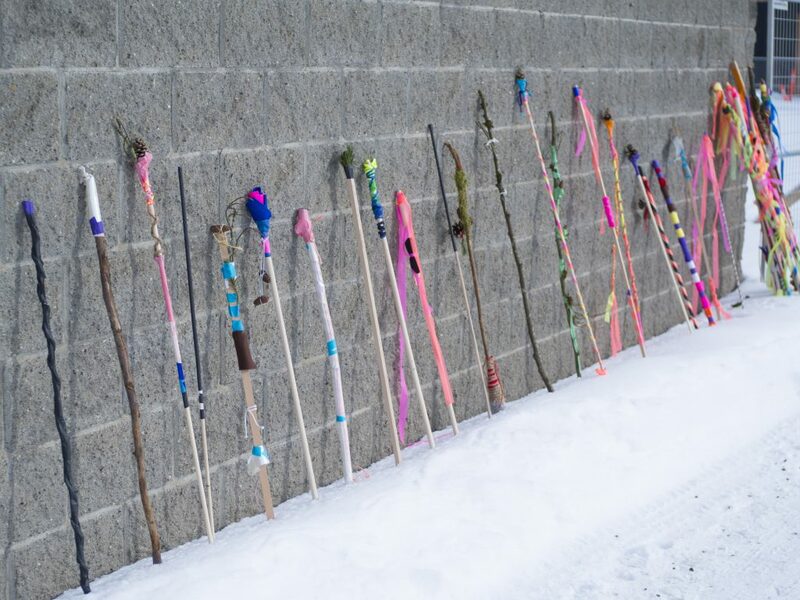 Sticks by students at Nusdeh Yoh School, Prince George BC, 2019. Image by Charlotte Falk.